​Restoring the reefs in San Andres, Colombia, after Hurricane Matthew Article from El Isleño, Jorge Sánchez, 18 October 2016 A group of divers composed of staff from the Coralina Corporation, diving schools on the island, private enterprises and the NGO “Help 2 Oceans” were present in the northern area of the island called 'Little Reef' responding to damage caused by the effects of Hurricane Matthew which damaged marine life in this reef formation. 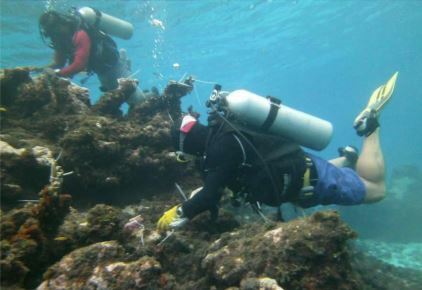 ​The restoration work followed a preliminary assessment of the area ordered by engineer Durcey Stephens Lever, Director of the Coralina Corporation and conducted by the Corporation’s Division of Oceans and Coasts. 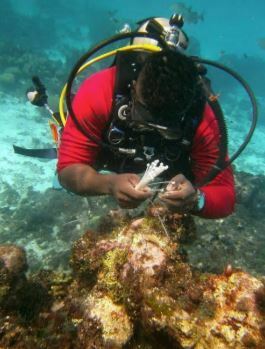 The restoration consisted of replanting some of the elkhorn reef fragments found. The combined actions were guided and driven by similar initiatives. 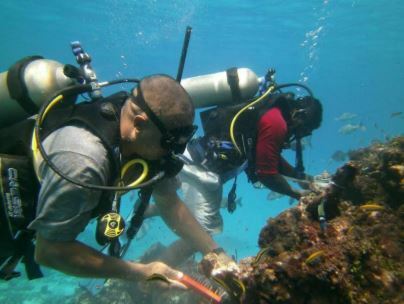 The famous environmentalist diver Jacques Cousteau (1910-1997) once said that faced with the consequences of the phenomena of nature, "we are able to drastically reduce its severity and consequences by acting quickly, and with understanding and unity of purpose".